NOTE: In my opinion, the maintenance issues in Waverley West are the ‘canary in the coal mine’ for what is to come with respect to maintenance of greenspace in ALL new developments under the current process of aligning design standards with maintenance funding. 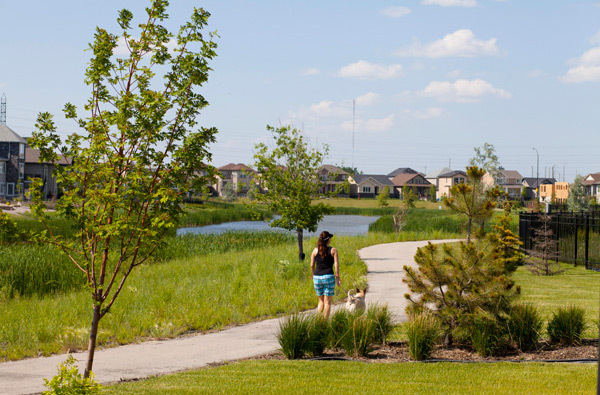 The lack of maintenance is NOT solely a Waverley West issue – similar issues are also occurring in the new residential developments of Amber Trails and Sage Creek. The BIG PICTURE is that we (the City) are responsible to maintain the properties that we approve – and we should be allocating the maintenance costs in the approval process. From what I can see at this point, the City has not aligned the maintenance costs appropriately in these new developments, and we must resolve this in BOTH existing developments and future developments. In new residential developments, the responsibility for maintenance of public green space transitions over time from the developer to the City. This process can sometimes result in confusion as to who has responsibility to maintain certain areas. The goal of the May 19th meeting is to provide an update on this transition, which will include topics such as the allocation of staffing, budget, challenges and opportunities. There will be also be time for Q & A. For more details, please see Map of Bridgwater Forest to understand the areas which the City and developer are each responsible to maintain. All residents of Bridgwater Forest are encouraged to attend this meeting – please share details with your friends and neighbours! My thanks to CBC Manitoba for reporting on this important story (see article below). JOIN A RESIDENT GROUP: Residents’ advisory groups are the voice of their community: they are the grass roots, the heart and soul of their neighbourhoods. If you would like information about the Bridgwater Forest Neighbourhood Association and other residents’ groups in the South Winnipeg-St. Norbert Ward, visit my Residents Group page to see how you can contact the groups directly. If contact information is not provided, please E-Mail jlukes@winnipeg.ca. People in Winnipeg’s Bridgwater Forest development aren’t happy about the state of their community after a deal with the developer to keep up the neighbourhood’s pricey landscaping expired. After seven years of living in the area, Kevin Chan said it’s become an eyesore. “It was nice at first, then all of a sudden, no one does anything. The sand is everywhere. The dandelions are horrible,” he said. South Winnipeg-St. Norbert City Coun. Janice Lukes said the problem is due to an expired contract with the developer, which was the Province of Manitoba. The area also has a broken fountain, which Lukes said will be fixed. She said the province was responsible for maintaining extra features like flower beds on boulevards, forests and other areas until their contract expired three years ago. “When [homeowners] bought in, it was maintained by the developer, and then after a period of time, the community maintenance is handed over to the city, and then the city maintains it,” said Lukes. But she said the city is doing “nothing” to maintain it because it’s too expensive. She said it could cost millions of dollars. “If the city has the final say and is approving this design five, seven years ago, weren’t people thinking that we’d have to eventually maintain it? It appears not,” she said. Who will pick up the tab for the beautification now, is a mystery. Lukes said the landscaping “detail” should have been dealt with more thoroughly through the city’s planning department when the development was approved, because the cost to the city to maintain it now is too high. On Thursday, Lukes is hosting a meeting with city parks and maintenance as well as the Province of Manitoba to talk through the problem with residents. As for Chan, he’s sympathetic to the city’s position. The meeting will be held at the Waverley Heights Community Centre at 7 p.m.